Stretch is my attempt to help Christians engage with the deeper truths of theology in an accessible way. One of my favourite topics to teach on is the Work of Christ. The resurrection has long been undervalued by evangelicals, largely because it is widely misunderstood. 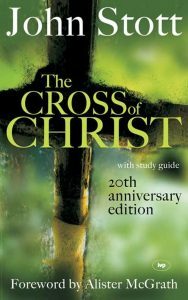 John Stott’s popular classic The Cross of Christ (1986) can be taken as representative of this common evangelical oversight. It is an excellent book that continues to enjoy well-deserved popularity. As the title suggests, it focuses on the cross as the centre of Christianity. To be fair I recognise that this book is not about the resurrection. However, I believe the way that Stott does treat the resurrection in this book is muddled and misleading. Christians have a lot to gain from gaining a better understanding of the resurrection than what Stott offers. Stott observes, with approval, that the early Christians made the cross the symbol of their faith because they believed that Jesus’ death was the central event of their faith and not the resurrection or any other event in Jesus’ life . Stott argues against the possibility that the resurrection is the centre and not the cross [41-50]. On this point I firmly agree. However, it becomes clear that Stott hasn’t adequately considered the possibility that the cross and resurrection together may be at the centre of Christianity. He does ask the question: ‘does not this book’s emphasis lie too heavily on the cross, and insufficiently on the resurrection?’ [275-6], however his answer is shallow and doesn’t really engage with what the Bible says on the topic. For example, Stott recognises that the resurrection is the emphasis of the Apostles’ preaching in the book of Acts [41-3]. The atoning significance of the cross barely appears. However Stott dismisses this by focussing on how ‘the seeds’ of the doctrine are in Acts before moving on to New Testament passages where the doctrine is clearer. I agree with what he says about the cross, however he completely dismisses Apostles’ emphasis in Acts. As a friend recently reminded me, the resurrection is the only element that appears in every single sermon there. That ought to have an impact on our understanding of the gospel. Otherwise we are saying that the first Christian sermons about salvation failed to teach the main point! What Stott fails to consider is that the resurrection might be as central to the gospel as the cross is. It isn’t just that one logically necessitates the other. It’s that each contributes to the way that Jesus saves in its own distinct way. Simply stated: the cross won forgiveness, and the resurrection won life. What Stott does say about the resurrection is confused. On the one hand he argues that the resurrection contributes nothing to salvation. He claims that Christ’s victory was on the cross, and not in the resurrection. Stott asserts that we must ‘be careful not to ascribe saving efficacy to both equally… For it is by his death, and not by his resurrection that our sins were dealt with. …But was it not by his resurrection that Christ conquered death? No, it was by his death that he destroyed him who holds the power of death’ . Stott holds that the resurrection is essentially testimony from God: ‘the divine reversal of the human verdict’ on Jesus . So ‘the resurrection did not achieve our deliverance from sin and death, but has brought us an assurance of both.’ [238-9]. On the other hand, at times Stott can’t help but admit saving significance to the resurrection. The resurrection is the means of Jesus’ exaltation to glory and Lordship . It means ‘in addition’ that ‘it is a living Christ who bestows on us the salvation he has won for us on the cross’ and he links this to us receiving the Holy Spirit and having future resurrection bodies ourselves [277-8]. Stott even states that both death and resurrection are essential ‘since nothing would have been accomplished by his death if he had not been raised from it.’  But there’s the tension. Why is the resurrection essential? Are the sending of the Spirit and the hope of future resurrection essential for salvation? How does it all fit together? These are questions that Stott doesn’t give clear answers to. However, his introducing these things with the phrase ‘in addition…’ summarises the way he treats them . They are treated as appendages to the gospel rather than being of core importance. In the Bible, the cross and resurrection are each capable of being the sole emphasis of a presentation of the gospel. To the Corinthians Paul summed up his gospel as the ‘message of the cross’. He claimed that among them he ‘resolved to know nothing but Christ and him crucified’ (1 Corinthians 1:18-25, 2:2). Elsewhere he expressed his desire to boast in nothing but the cross of Christ (Galatians 6:14). It is clear that preaching the cross of Jesus truly and faithfully encapsulates the Christian gospel. However, elsewhere Paul can speak of the resurrection without the cross, just as he can speak of the cross without the resurrection. In his shortest statement of the gospel, Paul says: ‘Remember Jesus Christ, raised from the dead, descended from David. This is my gospel’ (2 Timothy 2:8). Aside from Jesus’ name and title, Paul believes he can sum up the gospel in two topics: Jesus’ resurrection and his descent from David. (The reference to David refers to God’s fulfilment of his promises to David in Jesus: 2 Samuel 7:11-16). There is no cross here except as the logical prelude to the resurrection. Yet here is the gospel! In short, in the New Testament either the cross or the resurrection can be the focus of the gospel message without distorting it. Each was emphasised in different circumstances according to the needs of the audience (e.g. 1 Corinthians 1:18-2:5). Both are treated as essential, and both can stand for the entire salvation won by Jesus. The cross and resurrection aren’t two different gospels but the two core components of the same gospel. They each require the other to be of any value. On the one hand, Jesus can only rise if he died first. But also, God would only raise him if he was holy and deserved to be raised (Acts 2:27). Jesus’ overcame temptation and fulfilled his Father’s will faithfully. That is, he was raised because he was obedient to death. Jesus’ death was the core qualification for his resurrection. He deserved to be raised, and by his obedience won the glory and lordship that he now exercises. On the other hand, Jesus’ death is only of value if he is the risen saviour. If Jesus isn’t raised then it would prove that he wasn’t righteous before God and so undeserving of being saved out of death himself. In that case his death would not deal with sins at all! A lot of people seem to believe that if Jesus wasn’t raised we would still be saved. Wouldn’t his death would still have atoned for our sins? No it wouldn’t. ‘If Christ has not been raised, your faith is futile; you are still in your sins.’ (1 Corinthians 15:17). It isn’t just the cross that wipes away sins. It is only the cross of a resurrected saviour that atones for sin. The resurrection doesn’t just testify to what the cross achieved. The resurrection makes the cross saving. On the cross Jesus suffers punishment for sins. The resurrection is what follows if the completion of that punishment is complete and accepted by God. Only in a resurrection can Jesus be done with sin’s consequences. Without a resurrection there is no atonement. And even if our sins were forgiven by a cross without a resurrection, what would be the point? If Jesus is dead, there is no eternal life to receive. The only blessings of salvation we can possess are what is in Christ. That means that if Jesus lives eternally, so will we. But if Jesus is still dead, we can receive nothing better. The goal of Christ’s atoning sacrifice isn’t just forgiveness, but forgiveness leading to the eternal life won by Christ in his resurrection. It is a terrible contradiction for a person to be both forgiven and eternally-dead! So, as Paul says, ‘if Christ has not been raised, our preaching is useless and so is your faith.’ (1 Corinthians 15:14). Without a resurrection there is literally no salvation to be had. Just as Jesus’ death and resurrection go together, his offer of forgiveness and eternal life go together too. Praise God for all that he has won for us by the cross and resurrection of Jesus! Next Don’t Just ‘Prove’ the Resurrection. Explain why it Matters!